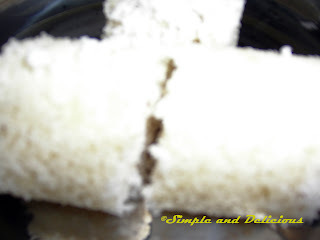 Puttu and Kadala | Simple and Delicious ! Soak black chana in water for one whole night. Mix with turmeric, red chily powder and salt. Cook in enough water till soft. Take one table spoon chana from this and grind to a paste or mash it. Mix this in the above cooked kadala. Again, heat coconut oil, splutter mustard seeds, add red chilly pieces, chopped onion.saute onion till transparent. Add green chilly, curry leaves and ginger chopped or crushed. Add tomatoes and coriander powder. When tomatoes are done, mix with the above kadala solution.check salt. You can make this by adding fried coconut instead of mashing chana. Fry half cup coconut with two small onions chopped and few curry leaves. When it turns brown, add coriander powder of the above quantity. Stir for few seconds. Blend this with enough water. Mix this solution with kadala and the above sautéed ingredients. Then just boil this. Wash and soak raw rice/ pachari or boiled rice / puzhungallari in water for six or more hours. Drain , and dry grind this to make powder. Fry this in a pan for few minutes. Or take rice powder one cup. Add enough salt. Pour ¼ cup water over this. Mix well with hands till it crumbles. Sprinkle more water if needed to make it wet. This looks like bread crumbs. Don’t add too much water. If you find it sticky add more powder and mix again. Boil water in puttu kudam / puttu vessel. 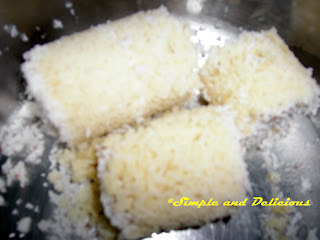 Take puttu kutti/ cylindrical mould; level two table spoons of grated coconut. Then add two handful of above mentioned rice powder. Then level little grated coconut above this to cover the rice powder. Again put two hands full of rice powder above this. Do this till the mould is full. Keep the last layer for coconut. Place the kutti/mould on the puttu vessel. Let the steam come through the kutti/mould. Keep for few minutes till the puttu cooked well. Remove the kutti/mould from the vessel and replace the contents into a casserole with the help of a chapathi roller. Take one cup rawa. Dry roast it for few minutes. Let it cool. Add little salt and sprinkle water over this. Mix well with hands till it crumbles. Don’t add too much water. Rawa doesn’t need the amount of water used for rice powder. Some times I add about one or two table spoons of rice flour in rawa to avoid too much of wetness. Just steam this in puttu kutti/mould without adding coconut. Let it cook for few minutes after steam come out. Take the puttu out and break it. Sprinkle little water and mix again. Then follow the method used to make rice puttu with coconut. This rawa puttu is very soft and we don’t need any curry with this. That much soft and tasty! We can make different kinds of puttu by this method. Wheat/ Godhambu, Badam/ Almond, Ragi/ Panjappullu, Kappa/Tapioca etc are among them. seenakutty, as usual me first. 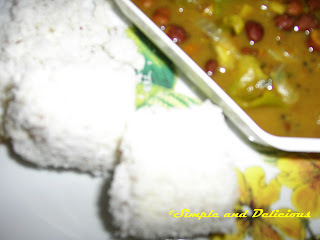 i remember you posted sometime back that you are going to blog about puttu-kadala too. btw are you taking pics too closely? because it is a bit blurred. why don't you zoom it instead? Oh, ask me how much I love Kuttu, I just don't have Kuttu maker to make on. I am going to get one soon. The dish looks tempting... and this curry goes well with Aappam too..is it not? nice post, seena. one never tires of puttu and kadala. I love puttu, but my family (hubby is a gujju) dont much care for it. I did buy some ragi puttu podi, will try it out. Infact the first time i had puttu with kala channa was in fonty, when one of my cooking club friends had made it. She was a mallu. It tasted great with kala channa curry. I am new to your blog. Your recipes are same like my umma's. Whenever I have any doubts with regards to cooking I call my umma, but now I have an option, your blog! I am new to your blog. Thanks for sharing your recipes. I made the rawa dosa, the fish curry using coconut milk and the coriander chutney and they came out perfectly. Thanks once again. Your recipes are easy and you give the instructions clearly so that it is very easy to make.